Megan Menzer has looked for ways she can contribute outside her store. 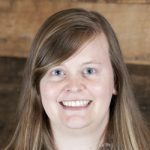 She has taken active leadership roles in organizations within her community and industry. 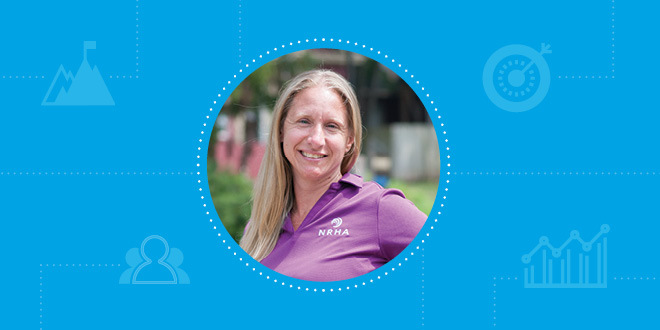 Today, Megan is serving as chairman of the NRHA board and has emerged as a high-profile advocate for independent businesses. 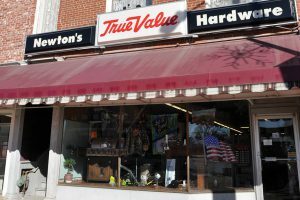 Megan Menzer (MM): Newton’s True Value was founded by my great-grandparents Grace and Earl Newton in 1924. They later passed the business on to their daughter, Nellie, and her husband, Albert, my grandparents. My dad took over the business in the late 1970s. I had the opportunity to work with my great-grandmother and my grandmother in the store. We were probably one of the first stores to computerize in our area. We computerized in 1991 when I was in high school. I went to computer classes with my grandma in Kansas City to do training. Today, we have two locations. Both stores sell hardware and appliances and feature large gift departments. The original business is in four old buildings downtown. The second location, which we opened in 2012, is a Destination True Value-style store. My family also operates a plumbing, electrical and HVAC company. Working at the store was always my first career choice. Growing up, my sisters and I would work part time down at the store. I would help my grandma with the business administration side of it. I remember doing books at her house. I would help her do payroll and write ledgers. I continued working part time at the store throughout high school and college. HR: What unique challenges do you think independent retailers face in today’s market? In your area of the country? MM: The consumer is changing every day, and trends don’t seem to last as long. What’s hot today isn’t hot tomorrow. So there’s a balance in determining how much inventory to carry and what products to carry. The consumer’s shopping habits are also completely different than they used to be. We used to have a lot of loyal customers, and now it’s more about convenience. They’re on their phones shopping instead of coming into the store. Saturdays used to be busy, but now kids have activities that the whole family is involved in. Instead of them shopping or being home fertilizing their lawn, they’re at the soccer game. So, one of our challenges is getting customers into the store and getting them engaged. Another challenge is with employees and finding knowledgeable people who want to work. It’s a huge challenge we never had in the past. Here in rural Kansas, there has been a decline in population that has really hurt us in the last five years. We had an Amazon distribution center and a hospital close, so those people left the area. The original Newton’s True Value spans four buildings in downtown Cherryvale, Kansas. HR: What are immediate solutions to those challenges? MM: We’re doing an inventory analysis and looking at resetting our store. I don’t think a 17,000-square-foot store is a necessity anymore. If there are other retailers out there who are looking to expand, I would recommend not having as large as a store. It may be beneficial to use that extra space for storage. Buy online, pickup in store is critical in today’s shopping experience. HR: Independent retailers say one of their primary appeals is convenience, but your experience suggests the definition of convenience has changed. How should retailers think differently about convenience? MM: With the changes to the entire shopping experience, convenience is a whole new dynamic. People need things immediately, and since they have the option to order online, and in some cases get same-day delivery, they won’t wait until you open your store in the morning. I think it’s important for independent retailers to be available to their customers. Give your customers your cellphone numbers, so if a waterline breaks, they can call you and you can be their immediate solution. I’m also interested in putting lockers in to give customers an option to pick up purchases after hours. That would help pick up sales, but we’re figuring out where to install them and how to manage that. HR: What are some of the key opportunities that you feel independent retailers will have in the short term? MM: Connecting with your communities in new and unique ways. We are focused on creating connections with customers and engaging with the community, but even that has changed. Sponsoring Little League teams used to mean something to customers, but it doesn’t really matter that much anymore. We have family-oriented events, like bringing in Disney characters Elsa and Moana. We host Pinterest project weekends to bring people in. It’s also important to be out in your community, serving on chambers and committees and getting to know people. I think people shop at places because they know the associates. That’s an advantage we have over the big boxes. It goes back to knowing who your consumer is and creating personal relationships. We have opportunities to create sales in our communities at the events we’re already going to, as well. Talking business with the other parents at the baseball game, that’s an opportunity. HR: What do you think the industry will look in five to 10 years? MM: That’s a million-dollar question. If I was asked that question 10 years ago, it would have been a lot easier to answer. I think in 10 years, the independent hardware store will look more like a convenience store. There will be smaller salesfloors, fewer staff members. We’ll be offering online shopping and expanded services, like deliveries. The change in technology will the biggest change in five years. It’s so hard to pinpoint because it’s so versatile. It’s really hard to say where things will go. I think we will definitely need to evolve or we will not succeed. Implementing and growing with technology is definitely a big demand on our area, so I hired a marketing person. We’re pretty small, but we needed it for our Facebook presence, and we’re also on Instagram now. 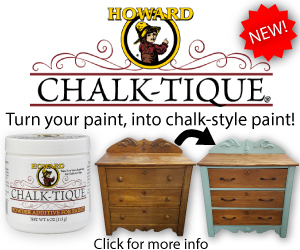 We’re also changing up our website by putting our in-store inventory online. We’re making those changes right now trying to enhance our online presence. All of these changes we’re making now go back to how the idea of convenience has changed, because we’re not open 24/7. 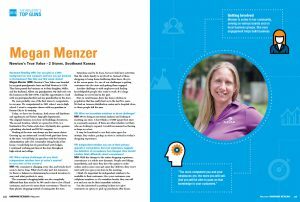 Menzer has been an active member of NRHA and a vocal proponent for independent retailing since being named Young Retailer of the Year in 2005. 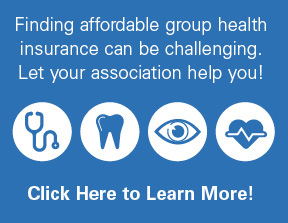 HR: Why was it important to you to get involved in the local organizations and with NRHA? MM: I’m involved in a lot of local groups, and it’s because I want to support my community. I’m on the alumni board for my high school, and I’m on an E-Community board that supports entrepreneurs. I’m involved in our chamber of commerce and our Main Street organization. In the past, I’ve coached Little League, and I served on the church board and as a Boy Scout leader. When you’re in a small town, that’s what you do. I didn’t pursue it just because I’m a business owner in a small town. It’s just who I am. I’ve also connected with other business owners locally to create partnerships and cross-promote. There is a local gun store in town, and we’ve worked with them to get our name on the back of their shirts. There’s also a local jewelry store that we’re trying to find a way to partner with. It’s about showing you support each other locally. For retailers who are looking to get involved at the local level, I recommend starting with your chamber. There are a lot of activities that the chamber of commerce does. You can pick something that is a hobby or something that you enjoy. They’re always looking for volunteers. If you want to get involved with other businesses, I say start small. Find something you have a passion for and get involved with other business leaders. Get your name out there. I think it’s very important for a business owner to be involved in organizations. Even if you start doing something because it’s something you’re interested in, all of those people you meet help you make connections in your community. If you make those connections, they start shopping with you and they will support your business. On the national level with NRHA, I always attended conferences because I think education is so important. The more educated you are in any subject, the more you can help the consumer. 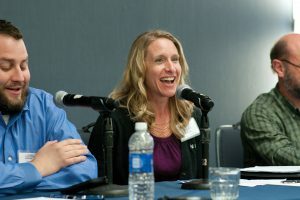 I’ve always really enjoyed the conference speakers and networking with other people. I received the Young Retailer of the Year award in 2005, and since then, I’ve kept getting more involved with the association. I was elected to the board of directors in 2009, and now I’m in my last few months of serving as chairman. MM: One of the largest benefits of training and networking with other retailers is the knowledge you gain. The more competent you and your employees are, the more you will sell. 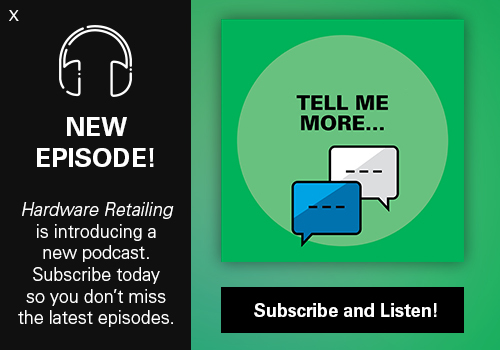 And you will be able to pass on that knowledge to your customers, which will result in repeat customers because they will leave the store saying, “They know what they’re talking about.” The education portion is huge. Through NRHA, the networking part of it has also been phenomenal for me. I’ve become such good friends with other retailers, and we spend a lot of time bouncing ideas off each other. We talk about everything. When we opened our second location, it was a new experience for me. I had a retailer friend tell me he would work with me for a month to help us get the store off the ground. The information that I’ve gotten from networking, meeting people and asking questions is invaluable.